* Orders shipping to PA, NJ, DE, MD, CT, Southern NY and Northern VA generally arrive in one business day with Standard Shipping, guaranteed to arrive within five business days. All other orders shipping to addresses other than the states listed above will generally arrive in two business days with Standard Shipping, guaranteed to arrive within five business days. $350.00 & Up Call 800.747.4808 for quote. For deliveries to Alaska, Hawaii, and Puerto Rico, please add $22.00 to the standard shipping charge. Please contact customer support at 800.747.4808 for Canada shipping inquiries. Please note UPS does not deliver to Post Office, military APO or FPO boxes. If you experience a problem with the quality of our chocolate, customer service, or delivery, please let us know and we'll do whatever it takes to make it right for you. If the full contents of your order do not arrive in perfect condition on the day you requested, we are more than happy to replace damaged chocolate, refund a shipping charge or take any other measures necessary to ensure your complete satisfaction. Customer service is extremely important to us. Our “policies” on resolving issues aren’t very verbose because they’re quite simple: We do what you’d like. Our guarantee applies to every aspect of your John & Kira’s experience. From navigating our website or speaking with our customer support staff up until you finish your last piece of chocolate -- if you aren’t 100% satisfied with every aspect, please contact us. If you just have some general suggestions for improvement, give us a call and we'll gladly listen! 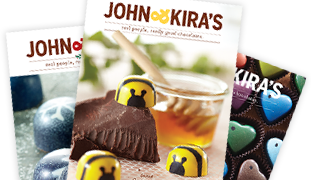 If you are encountering any difficulties at all, please email support@johnandkiras.com or call 1.800.747.4808 and we will begin resolving it immediately.